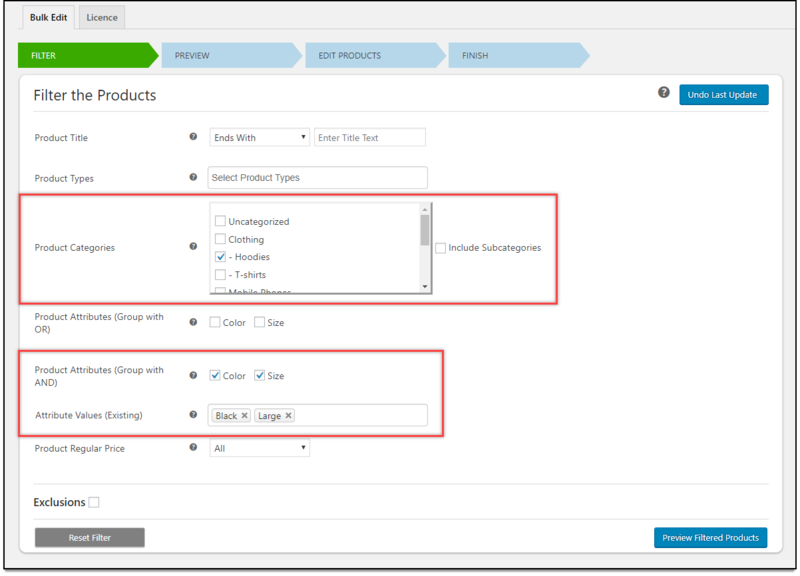 One of the customizations that every shop owner looks in a WooCommerce bulk edit plugin is to filter only selective products for editing. Even though you may be able to filter your products for bulk editing using the default WooCommerce bulk editing settings, it is short of useful options that you can easily get in a more functional solution like ELEX Bulk Edit Products, Prices & Attributes for WooCommerce. In this article, I’ll demonstrate how you can selectively filter products for Bulk editing on WooCommerce with ELEX Bulk Edit Products, Prices & Attributes for WooCommerce. Let us consider a use-case where we want to add the category ‘Clothing’ to all ‘Hoodies’ products, of only color ‘Black’ and of size ‘Large’. Here’s how we should do it. The filtering process is the first stage in the Bulk editing process. The plugin offers some useful filters like Product Title, Product Types, Product Categories, Product Attributes, and Product Regular Price. 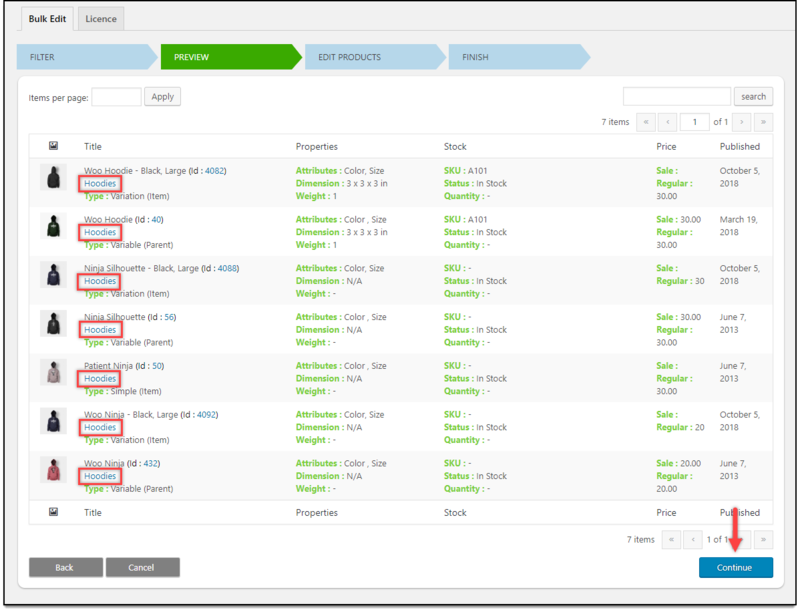 For our demonstration, we need to select ‘Hoodies’ category from Product Categories filter. When it comes to attributes, the plugin provides two filters; one with OR operation and the other with AND operation. The OR operation filter will filter products that have either of the custom attributes, and the AND operation filter will filter products that have all the selected attributes. Since we need to filter products that have both Black color and Large size as attributes, we should tick the ‘Color’ and ‘Size’ attributes in the AND grouping operation. Select the required attribute values from the drop-down list, and click Preview Filtered Products. In the second step, the plugin will preview you all the products that are filtered using the filters configured in the previous step. Based on our demonstration, all the products that have the category ‘Hoodies’, both simple and variable ones, and which have color Black and size Large as attributes, will be shown. You can notice that the product category has only Hoodies for now. The plugin offers several filters to bulk edit/update product properties. For our use-case, we need to scroll down all the way down for Product Categories settings. Add – To add an existing Product category to the filtered products. Remove – To remove the selected product category (or categories) from the filtered products. Overwrite – To overwrite the existing product category (or categories) with the selected product category (or categories). For our demonstration, we need to choose the Add Category option and tick the ‘Clothing’ category from the product category list. Once the products are updated, you will see a success message as shown in the screenshot below. Click Continue to see the updated changes. You can now notice that the ‘Clothing’ category is added to all the filtered products. In this way, you can Selectively Filter Products for Bulk editing on WooCommerce. In addition to this, there are a lot of things that you can achieve with this plugin. One amazing highlight of the plugin is the newly introduced Exclusions feature. With this feature, you can exclude products based on Product IDs, or/and Product Catagories for bulk editing. The plugin will ignore the product IDs and categories configured in this setting during the update process. Read an article comparing the features of some of the top WooCommerce bulk edit plugins here.